This particular unit was originally placed at the grade crossing at Hedding Street near 10th in San Jose. 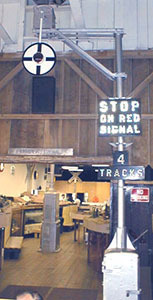 SP Signalman James C. Holmes placed it on “permanent loan” to the SBHRS museum in 1989. This signal is operational and when activated, evokes awe or nostalgic feeling from its viewers.